‘Blood pressure’ refers to the pressure of blood in the arteries as it is being pumped around the body by the heart. That means the higher your blood pressure, the harder your heart has to work. Higher than normal blood pressure is called hypertension and is a key risk factor for both heart disease and stroke. As an approximate guide, normal blood pressure is less than 120/80mmHg. High normal: between 120/80 and 140/90. High: more than 140/90. The larger number indicates the pressure in the arteries as the heart squeezes out blood during each beat. It is called the systolic blood pressure. The lower number indicates the pressure as the heart relaxes before the next beat. It is called the diastolic blood pressure. There are no obvious symptoms of high blood pressure and you can develop it at any age. The only way to know if you are at risk is to have a regular check-up. The good news regarding high blood pressure is that it can usually be controlled with lifestyle changes and/or medication if required. 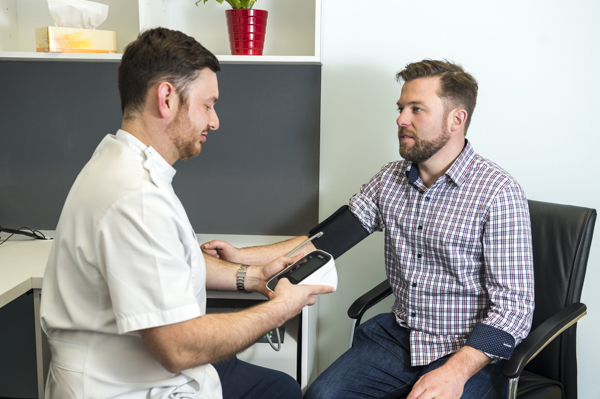 Capital Chemist offers a blood pressure monitoring service. Blood pressure is usually measured by wrapping an inflatable pressure bag around the upper arm. The bag is connected to a pressure measuring device. The entire instrument is called a sphygmomanometer. It is best to measure blood pressure when you are relaxed and sitting or lying down. The pharmacist will record and evaluate you blood pressure measurements on several occasions to confirm the reading and if necessary, refer you to your Doctor. Capital Chemist also offers Home Blood Pressure Monitors to purchase should you prefer to measure your blood pressure at home.